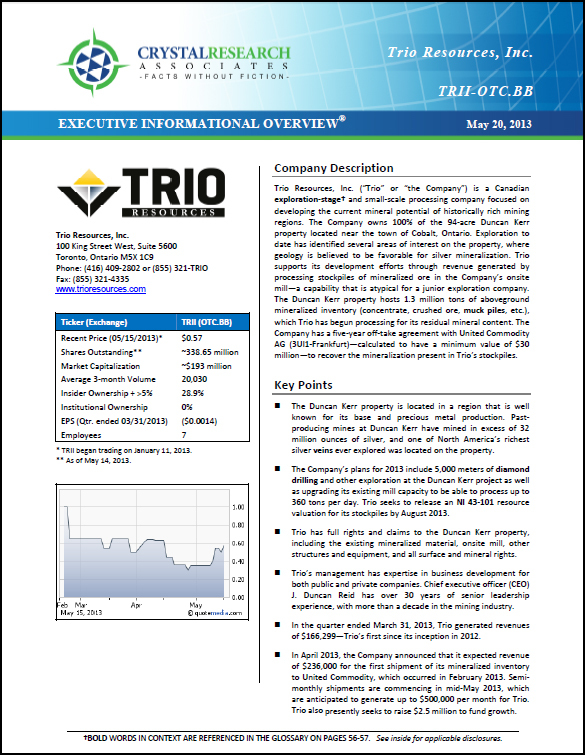 10 Things You Need to Know About Trio Resources, Inc.
Trio Resources, Inc. (“Trio” or “the Company”) is a Canadian exploration-stage and small-scale processing company focused on developing the current mineral potential of historically rich mining regions. The Company owns 100% of the 94-acre Duncan Kerr property located near the town of Cobalt, Ontario. Exploration to date has identified several areas of interest on the property, where geology is believed to be favorable for silver mineralization. Trio supports its development efforts through revenue generated by processing stockpiles of mineralized ore in the Company’s onsite mill—a capability that is atypical for a junior exploration company. The Duncan Kerr property hosts 1.3 million tons of aboveground mineralized inventory (concentrate, crushed ore, muck piles, etc. ), which Trio has begun processing for its residual mineral content. The Company has a five-year off-take agreement with United Commodity AG (3UI1-Frankfurt)—calculated to have a minimum value of $30 million—to recover the mineralization present in Trio’s stockpiles. * The Corporate Snapshot was last updated on May 20, 2013.